Despite the noise of a live band playing not far away, I managed to get a good night’s sleep, probably in part due to air con, and partly due to earplugs. I had water from yesterday’s snorkelling trapped in my left ear, and no amount of bouncing on one foot last night or this morning would dislodge it. Unfortunately this led to discomfort in this morning’s dive to Halik, north of the island. I had quite lot of trouble equalizing the pressure in my ear on the way down but eventually got things sorted out. The dive itself was not as impressive as others. We were carried by a current along a relatively featureless slope of mostly broken coral with a few pretty areas. We saw a few good local residents: a bump-head parrotfish, emperor angels, titan triggers, clown fish and a couple of sizeable turtles. Back on shore my ear started to bother me some more. Talking with a dive instructor, he figured that some salt water had got in and the ear became inflamed, effectively sealing it in, which explained why I couldn’t bounce it out. He suggested that I pick up some ear drops called Otopain from the clinic on the island, so we walked down there and I procured some with minimal effort and we strolled back. Dramatic weather was blowing across from Lombok: huge waves were breaking off of Gili Meno (with surfers riding them), and even Trawangan’s harbour had some waves rolling in, much to the delight of local naked kids splashing in the surf. We had lunch at a nice place just off the market. I munched a salade nicoise and drank a mixed fruit juice with coconut milk and vitamins in it. As we sat there the clouds and wind blew in dramatically and we even had a few splashes of rain. After, I stopped at Coco for my daily iced cappuccino and Kristi headed back to the bungalow as she wasn’t feeling great. We spent the afternoon relaxing: Kristi in bed, napping or with a book, and me on the porch with one of the local cats on my lap until she got too hot. There are lovely cats here, with long noses and large ears, and many with wrecked-looking tails. They are usually orange or some blend of white and grey-brown. Some are grey with lovely darker spots and green eyes. They all look related (and they probably are). The advantage of sitting and typing inside our bungalow is that avoids having to hear Hotel California one more time. Gili Trawangan’s musical catalogue must consist of a single CD of 70s and 80s classics that washed up on the beach some years ago and was copied and shared among every bar. It’s tragic and aurally numbing. Thank god you can’t hear music underwater as that’s where we’ve been for much of the last two days. Yesterday was two boat dives with Manta Dive. After a terrible night’s sleep in our very hot bungalow (the fan didn’t seem to penetrate the mosquito net and there was no breeze through the place) but a decent breakfast of banana pancakes and Lombok coffee (sweet and served in a teapot), we walked the ten minutes to the dive place. A wait while they located all the tanks they needed, and we were off in our outrigger boat to Manta Point. It was a great dive among excellent fan, staghorn and brain coral. Fish highlights were two cuttlefish, titan triggers, moorish idols, shaded batfish and many angels. Our dive master was Hermann, an Indonesian guy, very relaxed. Back on the island we had lunch at Coco – baguette sandwiches and excellent iced cappuccino. 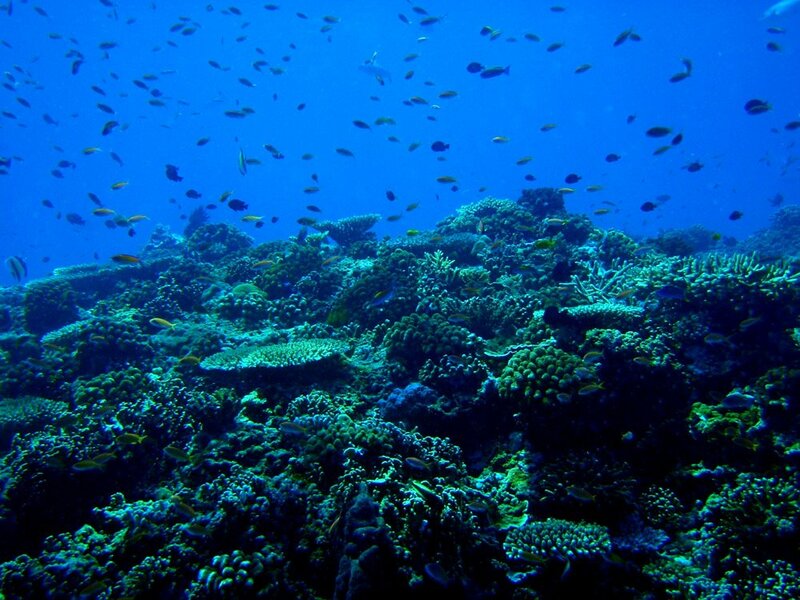 The afternoon’s dive was even better – to Hann’s Reef off the east coast of Gili Air, about a 20 minute boat ride away. It was a sandy dive teeming with life: cuttlefish, numberous lionfish, turtles, damsel fish, mantis shrimp, frogfish, a purple swirly juvenile emperor angel fish, a sea cucumber and a blue spotted stingray, hiding in the sand until he was coaxed to swim away – beautiful! A large pinnacle half-way through provided a great vista upward to hundreds of fish, the first sight here that’s really reminded me of Sipadan. A excellent dive. After a shower and some relaxing at Tanah Qita, we went for dinner at the farther south part of the ‘strip’, to an Indian restaurant called Pesona. We sat right by the water in a small pondok-like structure. The food was very nice: potato cumin curry, tandoori vegetables and paneer, creamy raita and lemon rice. After leaving the front and back doors of our bunglow open and catching some of the cross breeze, and putting in ear plugs (mostly because of the cockerels and the mosque), we slept much better last night although I still felt a bit groggy today. By 8am we were snorkelling on the beach right across from the bungalows. The snorkelling was not far off of the dives in quality. The water was crystal clear and the coral in great condition and dramatic. The fish were much of what we’d seen, but also included needlefish and a very large solitary pufferfish just relaxing in a sandy area. All of this just meters off of the shore and continuing great distances north and south. The middle of the day was devoted to checking out of Tanah Qita and moving down the road to the Manta Bungalows which, bless them, have air con. Yes, we are wimpy, pampered folks and are luxuriating in our mid-20s cool air. The layout is much the same, with a peaked roof and curving walls, a front porch leading out to a garden and a back door leading to an enclosed open-air private shower and bathroom area. (As I write this there is a strange discordant cacophony between the mosque’s call to prayer and the bass lines from classic rock along the beach). Mid-day was characterized by reading (both of us working our way through Neal Stephenson novels), another iced cappuccino at Coco, then a later lunch of quite tasty mee goreng at another beachside place, made a bit less pleasant by a small but obnoxious swarm of flies. We snorkelled again in the later afternoon, a bit further south on the beach. Visibility was not quite as good, my mask leaked, there were gaggles of small jellyfish, and Kristi lost her snorkel (getting out of the water somehow), but we saw some good stuff including a black and white-striped sea snake, a turtle snacking on coral, a picasso fish and an enormous titan triggerfish tearing chunks out of the coral while a group of smaller reef fish looked on, probably waiting for tasty morsels. The sunset from the top of the island’s single hill was a non-event, unfortunately. I imagine that it can be spectacular as it sets right over Bali’s volcanoes, but as usual, they were socked in. Ah well, it was an interesting walk through the local village and up the dry dusty hill among numerous goats, some chickens and a cow or two. Views down on the developed part of town were good, as were those on the large breakers rolling in from the west. Since I last wrote, the United States elected a new president – Barack Obama. I hope that this signals a new era for Canada’s southern neighbour. They were in desperate need of a sea change in their leadership. We have crossed a sea, or the Lombok Strait at least, and are on Gili Trawangan, a small island, 2x3kms in size, off the coast of Lombok. I was here three years ago and things have changed. I’m not sure if my memories are blurring into those from Gili Air, a nearby island with a more laid-back character, or if things are really that different. I think that they are. There seems to be a lot more development up and down the beach, and a lot more younger European tourists looking to be in the party mode with their Bintang beer shirts, flip flops and large designer glasses. They made me feel old and a bit snobby. Anyway, Gili Trawangan is still a lovely place, free of cars and scooters (horse-drawn carriages and bikes only) and surrounded by clear turquoise water teeming with corals and fish and turtles and other sea life. We checked out of Tegal Sari in Ubud early this morning and rode a van into Badangbai, a nondescript coast town that was in the midst of having a cruise ship arrive. We rode across to the Gilis on the GiliCat fast boat with about 12 or so other folks. The trip took only an hour and the highlight was seeing a pod of dolphins leaping from the water. The boat was a vast improvement over the flight, car and boat trip I took last time. The boat arrived on Gili Trawangan around 11:00, and we stopped in at Manta Dive to tell them to expect me for my refresher course shortly. We left our bags there and set out to find a place to stay. Last time I was here I stayed in a place called Queenrich Bungalows for a few dollars a night. Although I brought a picture of the place and the owner, we couldn’t seem to find it. Instead we settled on a bungalow at Tanah Qita, fairly far north up the beach. We have an A-framed thatch bungalow with a smallish room, a covered porch (where I am writing this), and a fun open-air shower and toilet out back. We are on the main road across from the snorkelling beach, but although we are in the front-most bungalow, we are still set back around 25m meters from the road behind a large, open garden. Back at Manta I did an hour-long refresher course in the pool that went over the scuba basics and really set me at ease (Kristi just completed her certification in Vancouver, so she was good to go). Around 2pm we set out on a dive, heading north around the island to Shark Point. The dive went really well and both of us were totally relaxed. It was great to be back in the 28-degree water with good visibility and incredible sea life. Over the course of our 47-minute dive (down to 21 metres), we swam past giant coral mushrooms and over fan corals and sponges, and saw sea turtles, trigger fish, angel fish, parrot fish, sweetlips, parrotfish and even a few white-tipped reef sharks hiding out under a coral overhang. 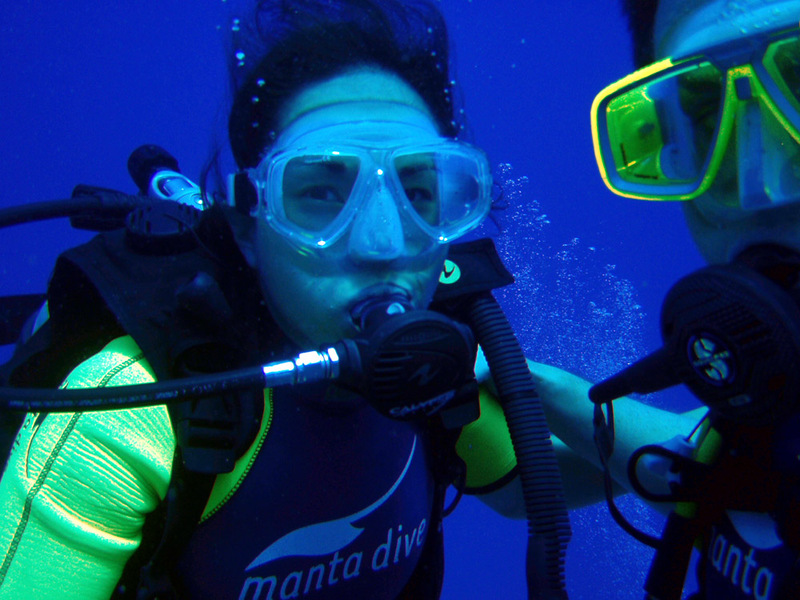 Although it wasn’t as dramatic as my dives in Sipadan, Malaysia, two years ago, it was still a great deal of fun and very nice to share this experience with Kristi. After the dive and debrief, moved our stuff into our bungalow and showered, then went out for a delicious dinner at Recchi’s Living Room, down near the ticket office. I had northern Lombok fish saté (minced fish and coconut milk and spices), a Bintang beer and banana fritters with ice cream for dessert. Kristi had a tuna and veggie salad and fried tempeh. To help digest all this nummy nosh, we walked south down the main strip. It just feels more busy and buzzing than I remember. I should say something about our last days in Bali. It’s Thursday today; on Tuesday we made a point of not doing much more than relaxing. We spent the morning reading at the hotel, ate at the Lotus Lane in town (huge and good chocolate mousse), and then walked to the market and back to the hotel in a leisurely loop, Kristi buying a few presents for folks along the way. Yesterday was a great finale to our day on the island. After an early nasi goreng breakfast on our balcony over the rice paddy, we got a lift into the main market to watch the action of the locals’ food market. It took some time to find it as most of it is underground, down some wet stone stairs into this inferno of fruit, veggie and meat stalls and small food stalls emitting large amounts of smoke. It reminded me of the Psar Chas in Siem Reap, Cambodia, but for Kristi it was her first such experience. Next stop was a Balinese cooking class done by Casa Luna at the Honeymoon Guesthouse (very nicely laid out with statues, fountains and great wood and stone relief carvings), which lasted almost four hours and started with a lecture on all the ingredients central to this kind of cooking. Most of it was about spices and gingers and the balance of sweet, salty, spicy and sour flavours. After this, our instructor prepared a series of dishes served on ceremonial occasions: fish and chicken saté, green beans in coconut, ferns, yellow rice, corn fritters, sembal and black rice pudding for dessert. To drink we had sweet cold hibiscus juice and a mild rice wine (like good saké). The most important element to the food is the fresh spice mix, all ground up on a large, flat stone mortar and pestel. The course was very worthwhile, and the food very good. It will be interesting to try and recreate some of it at home. The climax of the day was an evening Kecak performance at a temple in the north part of town. Kecak involves a large male chorus chanting in a complex and highly-synchronized way, seated in a circle around a central altar. The men wear chequered sarongs and create trance-like songs and chants, calls-and-responses. An element I was not familiar with was the storytelling from Hindu mythology using a series of dancers entering the circle. These included very elegant female dancers in gold and green as well as a whole pantheon of Hindu gods and demons appearing in frighting or even comical roles. For the entire dance or ritual, the men in the circle continuously chanted and sang, sometimes jumping up, other times lying flat upon each other, and even getting involved in the action, hoisting fighting gods up on their shoulders to do battle. This all lasted at least an hour and the audience was enraptured, applauding and cheering loudly when it was over. The finale was a fire dance. A large pile of coconut husks was placed in the middle of the courtyard, doused with fuel, and lit on fire. The kecak chorus appeared again on the far side, and when the fire had burned down to embers, a man with a hobby horse-like costume and bare feet entered, and in a trance-like state would jump on an kick the embers in every direction. Helpers would re-pile the embers and we would do it again, maybe four times in total. At one one point, a pile of embers landed on an audience member who screamed and jumped up, suggesting that the embers were something to be reckoned with and not some trick. The ritual ended when the man collapsed into the kecak men, and a priest entered and blessed him with holy water. His blackened feet were clear evidence of the power of his trance. The entire evening in the temple was the perfect way to mark the end of our few days in Bali.